I still have tons of boxes to unpack, and I can't get my hands on a few of the things that I'm looking for, but I thought I'd show you my quick fix for my "Late Fall/Wait Till Thanksgiving is Over With" upstairs mantel. I've had a running joke with a few of you over the fact that my Fall Mantels go through 4 or 5 transitions before Christmas. What can I say...Fall is my favorite time of the year! I'm lazy when it comes to decorating the mantel. If I find the "basic" elements that look good, and that I can "add to" for the seasons, then chances are they will stay there. The big mirror is bolted on so there won't be any mishaps, so that will be staying. I love my Wolff Pottery urns, and I can change the seasonal flowers and greenery easily, so they're a staple also. Ditto for my mantel lamps. They are easy to work around and I love the warm glow they give in the evening. I love the versatility of a Preserved Boxwood Wreath, especially in the cooler months. And so my wooden monogram from a couple of years ago was the natural addition. I'd like to use a seasonal ribbon to hang them with, but Hubbs would have to get a ladder and make that happen. With all that's going on to still get unpacked here, get the lease house cleaned and ready to turn back over to the management company, and then get ready for Thanksgiving and company, I haven't made that request. Maybe next weekend I can persuade him get that accomplished. Just pretend that this cute little leopard print ribbon is holding up that wreath and monogram...doesn't it look pretty? 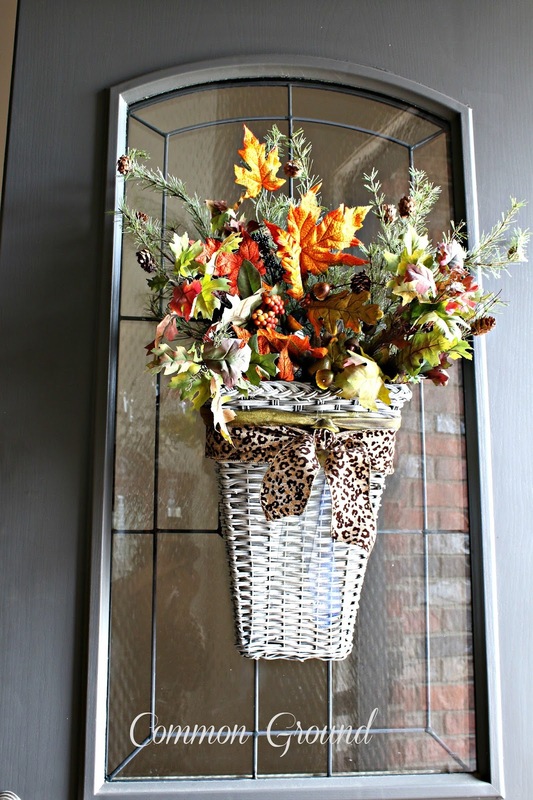 And speaking of Leopard Print ribbon, I made a quick change on the front door basket with a few pieces of faux greenery and leaves, just taking out the sunflowers from the "Earlier Fall Version". Next weekend, it will be reworked for Christmas. You can see my reflection in the glass...BTW I'm still in my leopard print fuzzy pajamas taking pictures with the door open while cats are escaping to the front porch. Sure hope no neighbors were out there. They've already been warned about my crazy blog photo habits. My two large boxwood orb topiaries fit perfectly here on the hearth. I imagine they will stay there, at least for a while. I wanted to add a little Fall color without going overboard, so a few preserved leaves and Bittersweet were added. I'm not sure what direction I'll go for Christmas decorating, but I'm sure it's going to be "simple" whatever it is. I always love a "natural" approach with greenery, some ribbon and a few small touches. I have my Christmas boxes and tubs in the garage, but it's been so cold, I haven't even looked through them. OK, I'm headed toward the garage to rummage around a little. I want some new ribbon for Christmas...don't know what that will be. Guess I better see what I have first... Have you started Christmas shopping yet? Amazingly, I have a jump on things from ordering over the Internet. The credit card has been smoking! Thanks so much for all the sweet comments from the last post about my old door and blogging, I read and appreciate each one. I've started Cardiac Rehab and it seems to be wanting to take over my life. Going to the gym has never been something I've ever wanted to do, but now I have no choice. Also, I'm having to endure old men wanting to flirt. Please Lord, make the next 12 weeks go quickly. ha ha, leopard gym clothes...haven't gotten around to that, but I DO have these crazy tennis shoes that are purple, turquoise, black, crazy...LOVE you too!! You're not the only one to step outside to take blog photos in clothing that is no where near acceptable to wear out in public! :) Anyway, I love your mantle and that super pretty basket on the door! Oh my! I'm dying at the old men who want to flirt. The same thing happens to me. Of course they usually have an eye patch and a peg leg or so my husband teases. Too funny. I love the mantel. I'm so excited you're in a house of your own again. 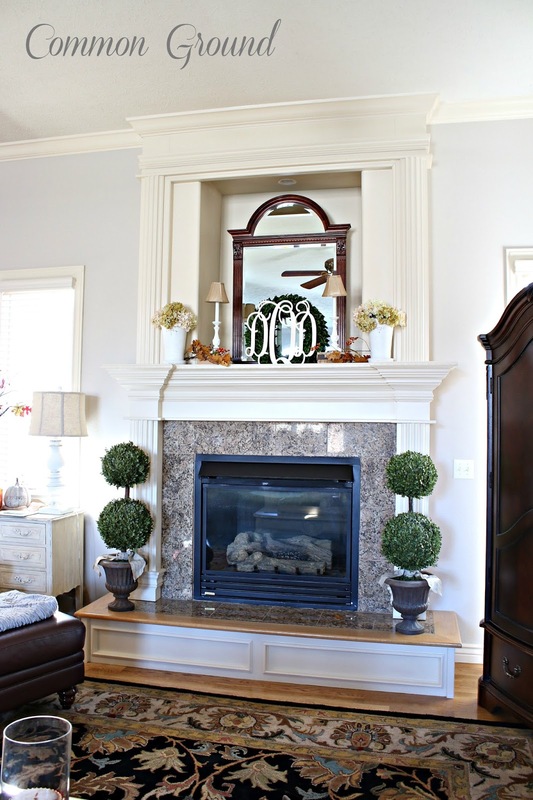 Deabra, I enjoyed reading this post and I love your "Late Fall" mantel! I hope you are doing well. Wishing you and your family a meaningful Thanksgiving Day. Your mantel looks very pretty, Debra! Since it is a new area to decorate for you, I am sure you will be tweaking it quite a bit. : ) The "flirting" may make for a good motivation to keep at your therapy and get it done. This way you can get the heck out of there! 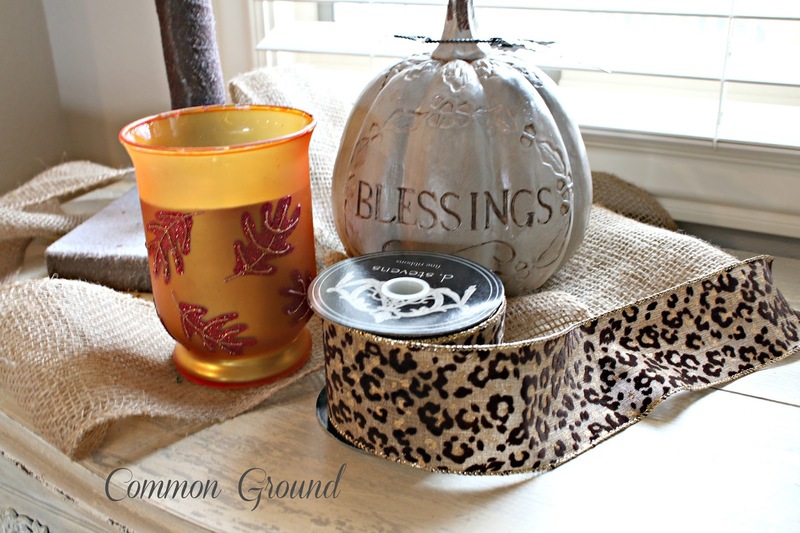 That leopard print ribbon around your box wood wreath is going to be amazing, dear friend!!! 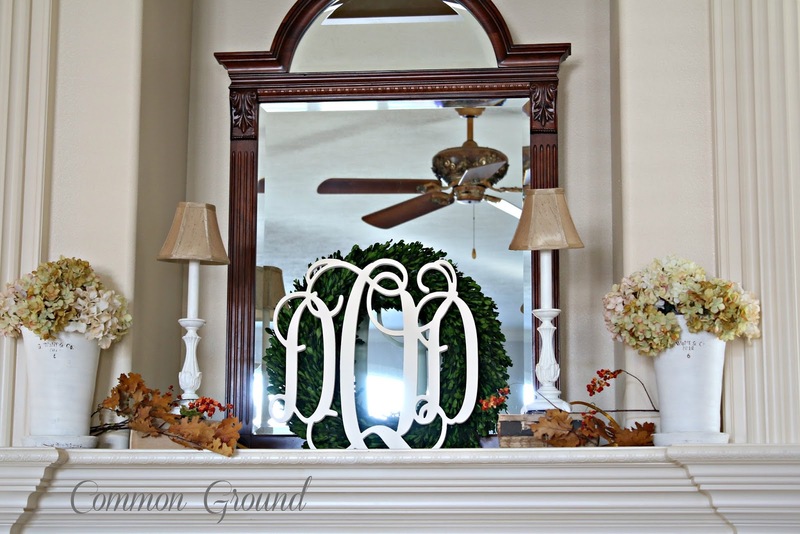 Love the mirror, wreath and boxwood orb topiaries for your mantle and hearth!!! I'm chuckling at your comment to the neighbors about your blogging habits. This past Spring, I took outdoor photos of items for our Tag $ale. . .
and had to explain to my neighbor what I was doing!!! Much success on your Cardiac Rehab!!! I'm not a leopard kind of girl..or at least I thought so..But now that I've seen the ribbon on your basket front door I will have to rethink that! 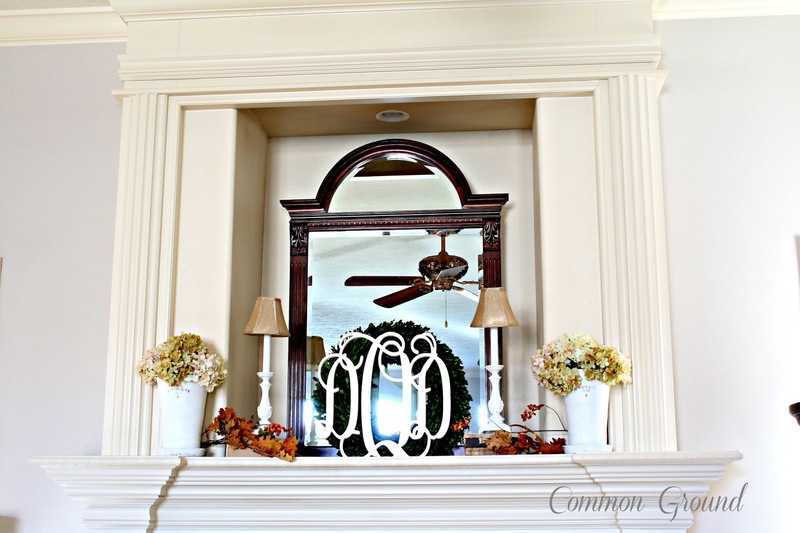 Love you fall fireplace mantel, simple, yet pretty, is a good thing! Debra, your refined style [well, except for the wild pjs ;)] is really nice. I really like how that mirror in the recessed area looks. I like how you show the ribbon and say, "just pretend...", lol [love the ribbon]. Oh dear, maybe you could just pretend you're going to rehab...not! Who knows, you may find you like the way it makes you feel or helps you sleep. Have a wonderful Thanksgiving. I love your new house! I love your colors and the mantle is shaping up beautifully. I feel like I relate with your sense of style so much. I just have a little more of a vintage/north woods vibe to mine, but similar colors and feel. I just recently joined the world of blogging and loving it so far! Debra, I love your MANTEL! You inspire me ALWAYS with your ideas! I wish my hearth was raised! When we built this house, we have one that is floor level! The raised one gives more seating:) Have a blessed Thanksgiving week ahead! HUGS! Debra - Everything you do whether in your old house, your temp house or your new house, I love. All of your ideas are so creative and inspirational. Love it all. Your mantel and door are beautiful..they always are!!! Have a great weekend.